The little red demon is finally in water! It didn’t get to Cocos Island until mid January then took another two weeks to get to my door. Fitted the electronics and outboard fine, quite impressed with the finish of the boat. The boat has got a lot of attention from the locals, not everyday a bright red boat arrives on the island! I wouldn’t be surprised if you get a couple of calls for Cocos Bar Crushers. The local copper (Harry) is mad keen on getting the same as mine for the lagoon police boat. 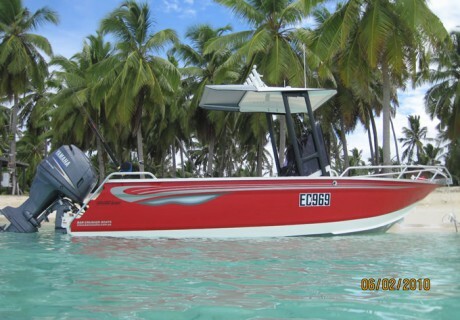 Went fishing with Geoff last weekend in his Bar Crusher 610C (now 615C) and caught five nice wahoo. He is the one who cut the nose off his boat and dented out the sea container! Maiden voyage for mine on the weekend, Saturday for a pleasant trip across to Direction Island with the family to run it in. Sunday out wide (as far as wide goes here) to fish, weather quite rough but the boat performed exceptionally well. Could keep up a good speed in all directions with hardly any ally slap.